Many major websites have been working in conjunction with activists to drive calls to Congress since the day Pai unveiled his plan to eliminate net neutrality rules just before Thanksgiving. According to Battle for the Net, over 833,000 calls have been made since November 21. Last week, internet users flooded the front page of Reddit with posts shaming their representatives for selling out to the telecom industry—and applauding those who have stood firm in their support for net neutrality. 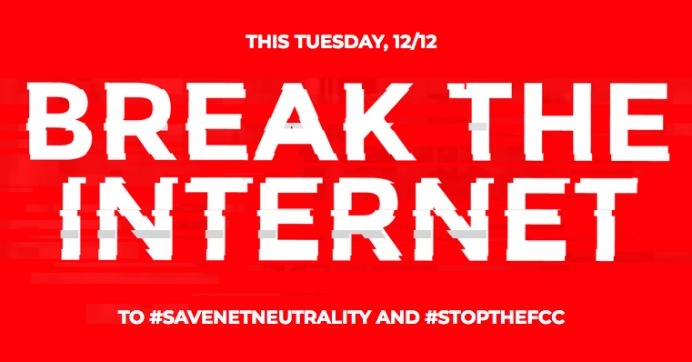 Individual supporters of net neutrality have also been encouraged to participate by flooding congressional phone lines and using their platforms on Facebook, Twitter, and sites to raise alarm about the devastating consequences Pai’s proposals will have on the web. Using the hashtag #BreaktheInternet, many have taken to Twitter to promote the upcoming demonstration and encourage others to take part.